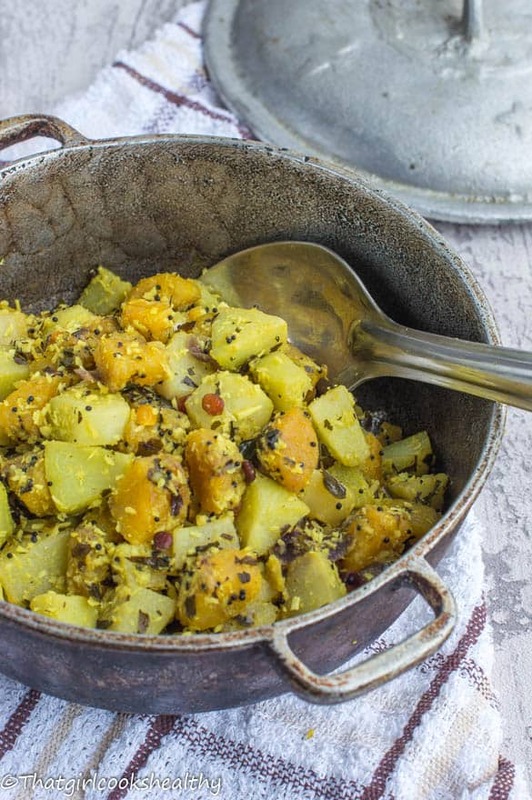 Plantain cho cho curry recipe – generously seasoned plantain and cho cho (chayote) cooked into a filling Caribbean stir fry. Brace yourself for this plantain cho cho curry recipe coming your way, this one is light and very very simple to make. I know sometimes curry recipes can be overwhelming, almost to the point of intimidation. Here in the UK curry are pretty much a part of the British culture, you won’t find a Town/City that doesn’t have a plethora of curry houses, that’s how notorious they are over here. Since experimenting more with Indian spices I have successfully managed to incorporate a more than usual selection of different spices into my Caribbean cooking. You see Jamaicans don’t toy around with a laundry list of Indian spices incomparsion but say Trinidad and Tobago or Guyana, they tend to use pre-blended spices and season with those instead. 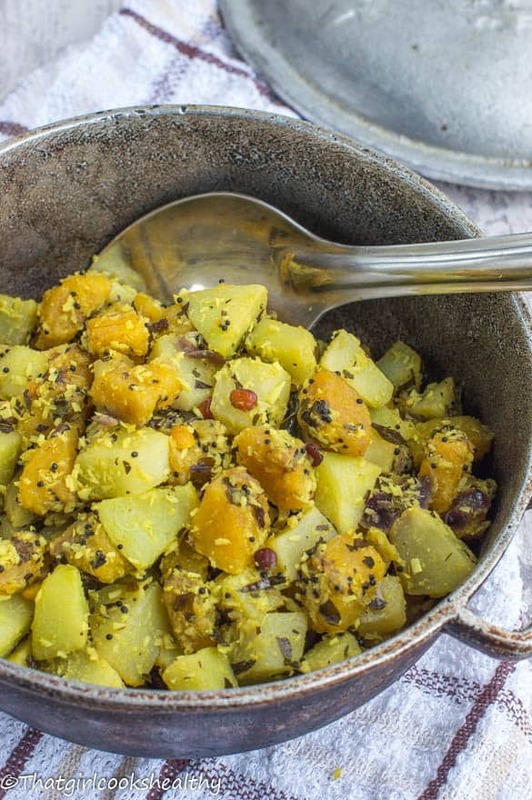 This plantain cho cho stir fry has an influence of Caribbean flavour with raw Southern Indian spices – lightly seasoned and not too hot, so if you’ve not a fan of heat, no worries as you won’t need to sit this one out. The scotch bonnet is added to the pan whole for flavour only, so heat won’t penetrate the food (as long as it doesn’t burst). Cho cho as it is known in the Caribbean is a pear shaped vegetable which belongs to the same family as melons and cucumber, that’s not surprising given it’s high water content. As with all high water veggies it is low in calories and a good vegetable to include if you’re weight watching. Cho cho is also known as Chayote, Christophine, vegetable pear to just to name a few. You can purchase Cho cho from any Indian or African Caribbean grocery store. The plantain really pairs well with the Cho cho not only as a clean complex carbohydrate vegetable, but also for some added sweetness, coupled with the shredded coconut. I’m telling you, this plantain cho cho curry is a tasty, meat free meal that’s filling enough for lunch or dinner. First parboil (partially boil) the plantain and cho cho for 2-3 minutes then drain off the excess water and set aside. 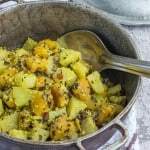 Heat the coconut oil in a frying pan and fry the mustard seeds, with the onion and split peas until the seeds begin to crackle on medium heat and the split peas/onion turn golden. Combine and stiry fry the vegetables for 1 minute before pouring in the hot water. Reduce the flame to low, cover with lid and cook for 10 minutes. What sort of split peas are used? Green? Hi Whitney. I used yellow split peas.